There's really no delicate way to put it: The blue-green algae outbreak is absolutely disgusting. It's thick, it's pungent and it's left Lake Okeechobee looking as if it just got slimed. While blue-green algae might be reminiscent of something from Nickelodeon circa 1997, the actual explanation is much more complicated -- albeit still gross -- and the consequences are much more dire. So what exactly is it and what caused the current outbreak afflicting the Sunshine State? Below you'll find an explainer with everything you need to know about the toxic sludge, including what causes it and what the state is doing to stop its spread. The information comes from Visit Florida, the Florida Fish and Wildlife Conservation Commission, Florida Sea Grant and other state resources. Green algae blooms are seen at the Port Mayaca Lock and Dam on Lake Okeechobee on July 10, 2018 in Port Mayaca, Florida. brackish water in all 50 states. Why is it blooming right now? As of early August, the blue-green algae bloom covered 45 percent of Lake Okeechobee -- which is down from the 90 percent reported in July -- but it is continuing to grow in what experts call a resurgence, according to Florida Sea Grant director Karl Havens. 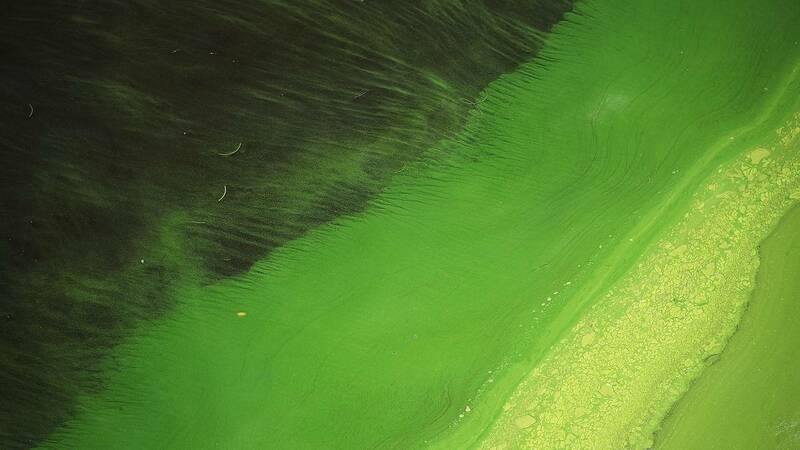 Nutrients, sunlight, carbon dioxide and relatively stagnant water are the main elements that encourage blue-green algae and this summer, Florida has had all four. The onslaught of rain that drenched the Sunshine State caused nitrogen and phosphorus from nutrient pollution on land to run off into the water. The sunny days that followed gave the algae the light it needed to multiple then couple that with a lack of wind, which keeps the algae at the water's surface so it won't mix deeper where light is scarce. Havens writes that Hurricane Irma last year and the recent rain created a perfect storm for this year's harmful algae bloom. 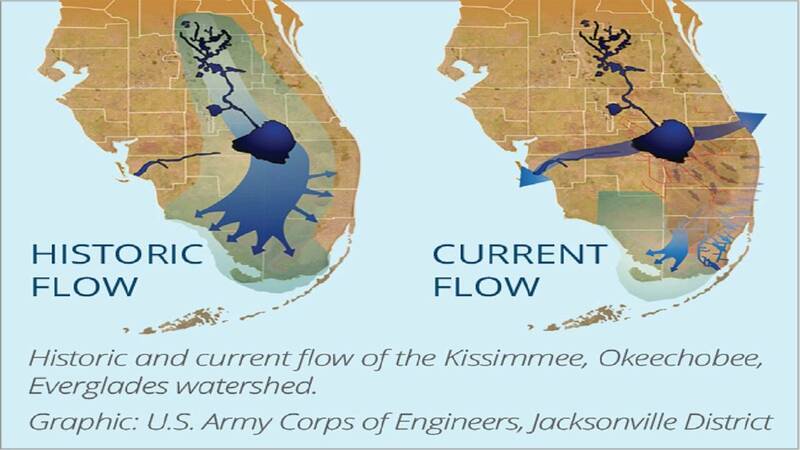 Why isn't the bloom contained to Lake Okeechobee? That same rain that's partially to blame for this year's bloom in Lake Okeechobee could also be part of the reason why it's spread. The rain caused the water level in Lake Okeechobee to swell, prompting the U.S. Army Corps of Engineers to release discharges so the water levels wouldn't threaten the integrity of the Herbert Hoover Dike, according to Havens. Those discharges move through a series of canals until the water ends up in rivers and estuaries to the east and west, including the St. Lucie River and the Caloosahatchee River, which both have had blooms this summer, TCPalm.com reports. The map above, provided by the Florida Department of Environmental Protection, details algal bloom sampling results across the state. While some believe that moving the polluted Lake Okeechobee water might have caused the harmful algal blooms in rivers and estuaries, Havens writes that's impossible to determine because those waters likely already had their own nutrient pollution. What negative effects can a blue-green algae bloom have? A dead fish is seen floating in the awful smelling algae in the St. Lucie River on July 11, 2016 in Stuart, Florida. Plenty, both for your health and the health of the environment. Visit Florida officials say that some, but not all, blue-green algae blooms produce toxins that pose health risks to humans. In the case of the bloom on Lake Okeechobee, scientists with the Florida Department of Environmental Protection said the algae is indeed toxic, according to TCPalm. State officials say that cyanotoxins can affect the liver, nervous system and skin if consumed in large quantities. Symptoms could include abdominal cramps, nausea, diarrhea, rashes and vomiting. Swimmers and anyone else who spends time near the water is advised to avoid blue-green algae accumulations. Anyone who does come in contact with it should wash immediately wash themselves with soap and clean water. The thick sludge that accumulates at the surface can eventually starve the water below of oxygen and sunlight, which fish and other marine animals as well as aquatic plants need to survive, according to the St. Johns River Water Management District. 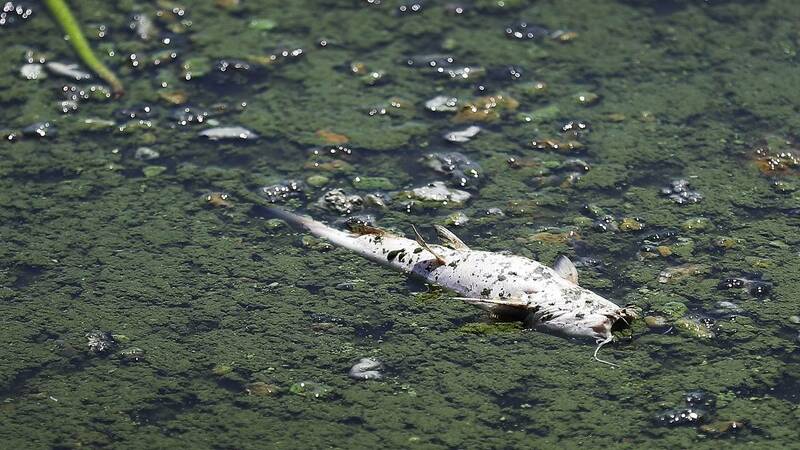 Oxygen starvation that directly leads to fish kills is usually seen at the tail end of the bloom when the algae dies, but the disruption in the food chain is seen early as the toxic blue-green algae outcompetes the normal zooplankton that small fish dine on. How do we stop blue-green algae from blooming? Photo courtesy of Gov. Rick Scott's Office. That's a question scientists have been trying to answer for decades. Removing phosphorus from water is one way to stop blooms from spreading, but that process is timely and inefficient, according to WLRN-TV. Currently, the Everglades Foundation in South Florida is hosting a contest in hopes that some entity can develop an affordable and effective treatment method. The Corps and the South Florida Water Management District are also working on projects to capture rainwater and filter out the nutrients before they can get into lake and estuary environments that are conducive for blooms, but Sea Grant officials say those projects are decades from completion. A solution to the algae bloom problem will likely require large-scale and long-term solutions, such as reducing greenhouse gas emissions to prevent bodies of water from warming any further. "Switching old neighborhoods from septic to central sewage, reducing the use of fertilizer to recommended levels on crops or capturing and cleaning the runoff water from those lands, controlling the export of nutrients in manure from animal agriculture, smart development solutions that integrate better stormwater management options, changes in land use, including in residential neighborhoods, to species of plants that do not require addition of nutrients because they are adapted to grow in our native soil," are some of the solutions Sea Grant has laid out. In July, Gov. 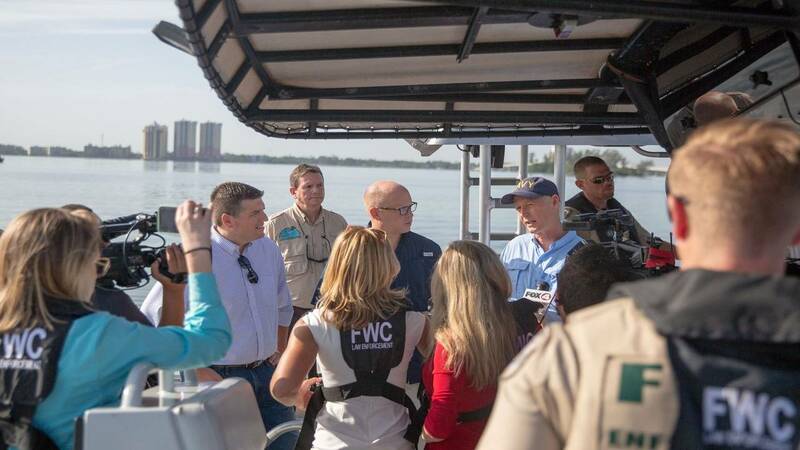 Rick Scott issued an executive order effective for Glades, Hendry, Lee, Martin, Okeechobee, Palm Beach and St. Lucie counties that waives certain restrictions about where discharges from Lake Okeechobee can go, thus relieving the flows forced into bodies of water that are already suffering from harmful blooms. 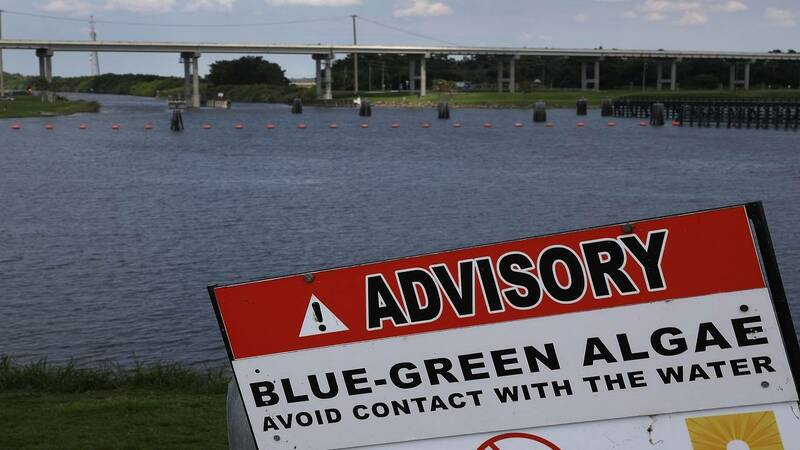 It also directs the Florida Department of Environmental Protection and FWC to dedicate more staff to water testing and directs the Florida Department of Health to increase signage warning of blue-green algae dangers. The Environmental Protection Agency also has an extensive list of tips on how to cut down nutrient pollution in your home, in your yard and in your community. Those tips include cleaning up after your pet's waste, repairing leaky faucets, not fertilizing lawns when rain is expected and using public transportation. See the full list here. For more information on what you can do to help improve the conditions of Florida's waterways, click here.